After a lengthy process, the site for the 2018 Fall Conference has been chosen. 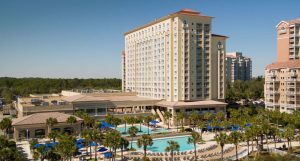 We will meet September 26-29 at the Myrtle Beach Marriott Resort and Spa at Grande Dunes in Myrtle Beach, South Carolina. This recently redesigned and renovated hotel is beautiful, luxurious and right on the beach! We have secured a very attractive room rate that is only $6 more per night than last year’s venue in North Charleston–$145 per night, plus taxes, of course! More details about our program, reservations and conference registration will be posted here soon!